Well, are you not? 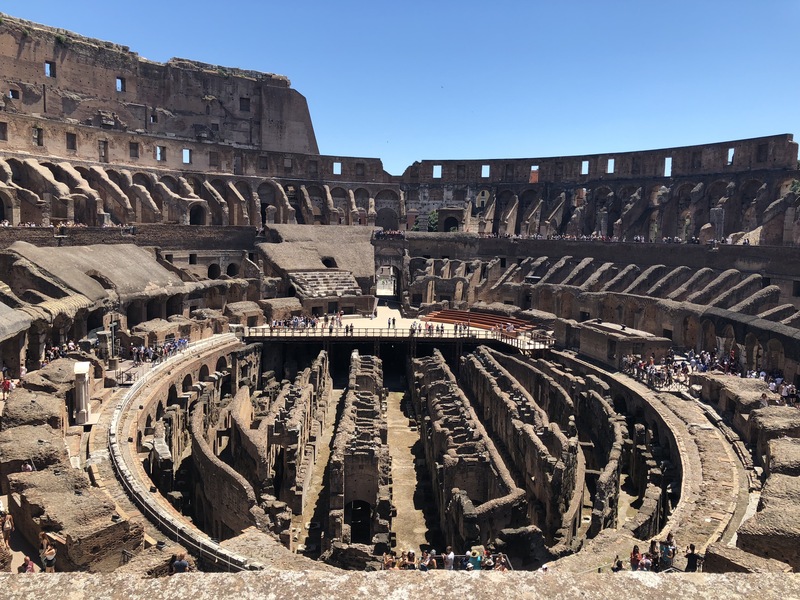 My class and I took a weekend excursion – and an adventure it sure was – to Rome, Italy to observe all the influential art, architecture, and culture the city had to offer, and I have never been so academically stimulated by amazing information in all of my life. The Roman Forum: Ruins of a great ancient city. 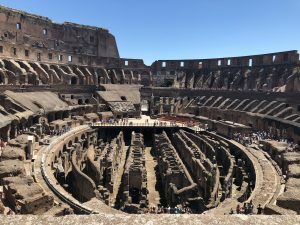 I have always dreamed of going to The Coliseum; I have imagined the roaring crowds and spectacular events that transpired within its grand walls. 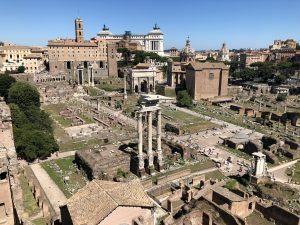 I have pictured the Roman Forum sparked to life with bustling people selling fruits and clothes in its markets: a whole world now submerged within the foundation of the now cosmopolitan city of Rome. I find it sad seeing the changing of times as I find the skeletal remains of the once great city a beacon for knowledge and an insight into the world of yesterday. Tourists come from all over the world to marvel at the beauty hidden within the remains of ancient Rome’s archaic walls; there is a kind of energy when you walk through the Forum and the massive walls of the Coliseum that made me feel as if I were there, fulfilling my childhood dreams by hearing the roar of the crowds, smelling the aromas, and feeling the rich heat in the air. I was swept away into an ancient world, a part of a people magnificently advanced for their day and age. Inside the largest oval amphitheater ever built. The Coliseum: the house of Gladiator battles, entertainment, and most recently, a Church. However, contrasted against the bustling of people and the modern-day amenities like cars and paved roads, and phones and cameras, The great Coliseum and Roman Forum seemed out of place; they seemed too special to be out in the open and juxtaposed against this modern-day background. My expectations had pinned these ancient monuments to feel as if they were a part of their own world, but instead of being preserved in their own historical right and location, the major city of Rome was built around and within them. To me, this seemed like an intimate breach of their history; like the specialness that was and still is The Coliseum and the Roman Forum was somehow decreased due to the fact that they were reduced to but another “sight” to see on the upcoming Hop-On, Hop-Off Tour Buses passing through every half hour. Don’t get me wrong; they were absolutely, undeniably, breathtaking, and definitely fulfilled my childhood expectations. However, when observing ancient relics like these contrasted against the modern background of camera flashes, vehicle exhaust, and modern-day technologies, there is a part of me that wishes to experience them in their prime. 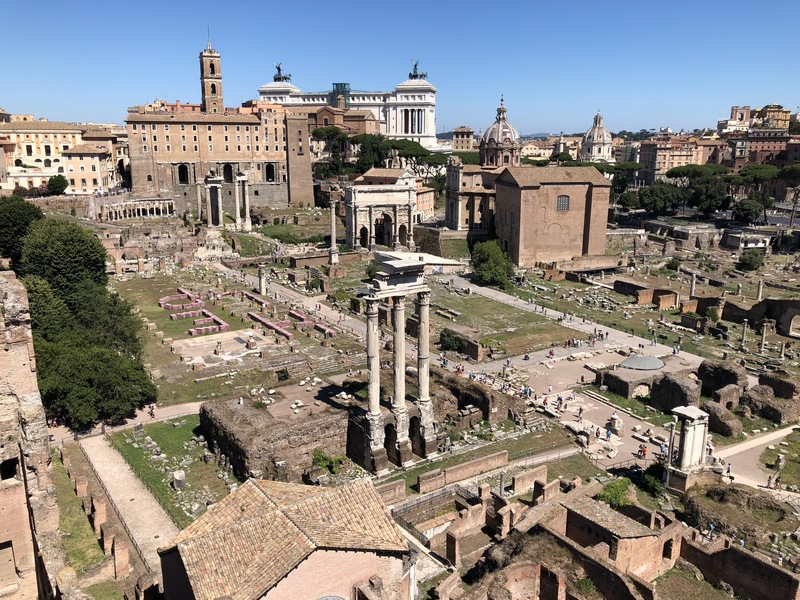 History has a way of transpiring in that it always finds a place in our hearts, and The Coliseum and Roman Forum have definitely found their way in mine.